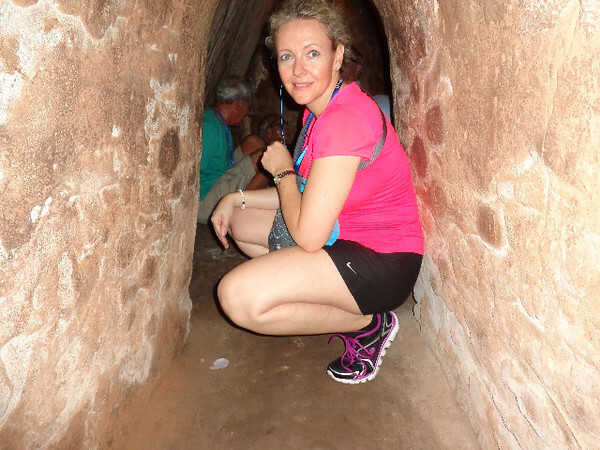 The biggest highlight when in Ho Chi Minh City in our minds though is a short drive outside the city where the "Cu Chi Tunnels" are. This vast network of tunnels was made famous by the "Viet Cong" army during the war as they lived there, hid out there, had kitchens & hospitals there, etc. It's said this 150 miles of tunnels were the biggest fear of American soldiers as they made the fight against the Vietnamese extremely difficult as they were so hard to locate! There's Nancy showing just how small their "living quarters" was!